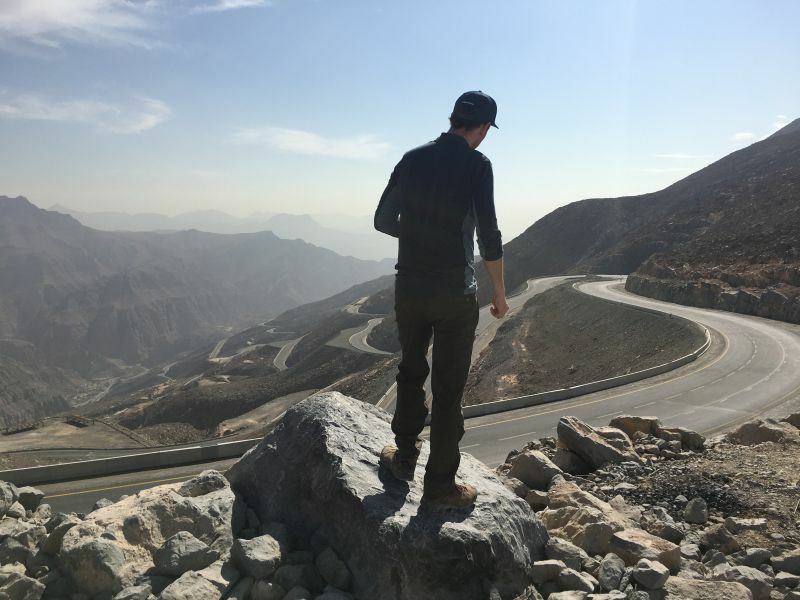 Ras Al Khaimah… It’s probably not a location known to all that many. 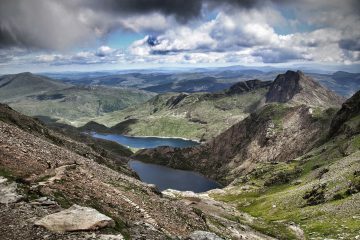 And those of you who do know it probably wouldn’t think of it as an adventure destination. 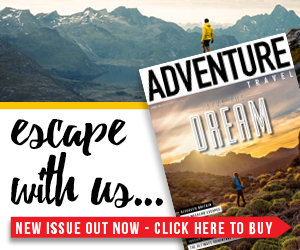 But all that is about to change, and we’ve been lucky enough to head out to this up-and-coming emirate to find out exactly why. 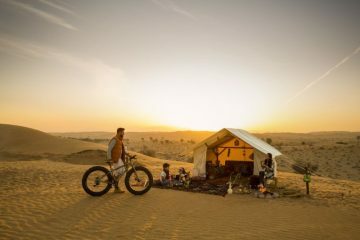 To start with, the emirate benefits from year-round sunshine (visit in winter for cooler temperatures) and roughly 40 miles of white sandy beaches which serve to be the perfect launching point for a huge range of watersports. As you would expect, a network of affordable five star hotels offer accommodation matching that of Dubai while being kinder on the bank account. Further inland lies both the desert and the mountains. The former is perfect for exploring on camel, horse, or in the seat of a 4×4 on a dune bashing excursion (well worth checking out). 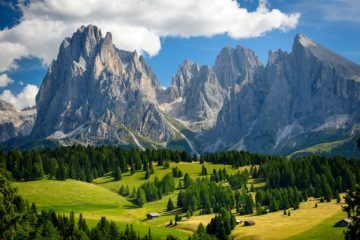 The mountains are where things really start to get exciting though, offering a range of adventures including mountain biking, hiking, canyoning and, of course, via ferrata. The Hajar Mountains stretch across Oman and part of the UAE, entering RAK in the east, and were formed over 70 million years ago. Among them stands Jebel Jais. 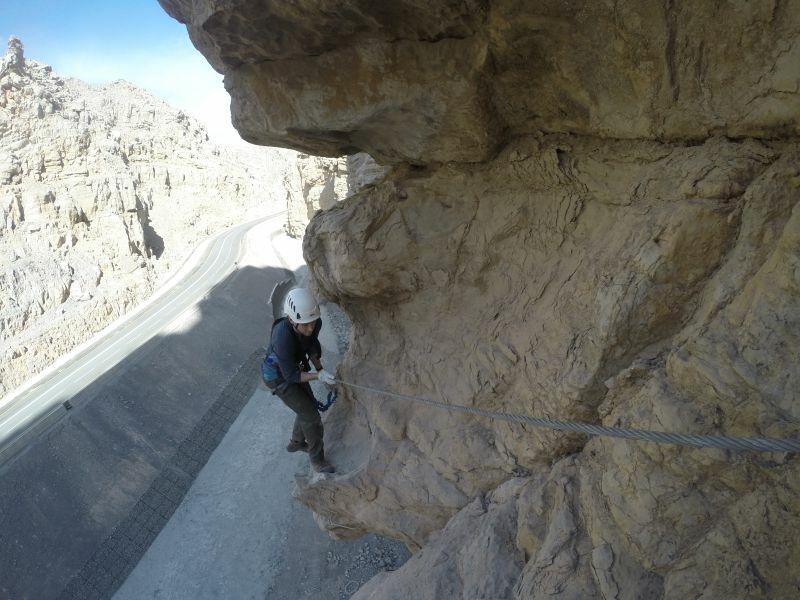 At 1,934m it’s the highest in the entire UAE and, as it happens, it’s also home to both the country’s, and the entire region’s, first commercial via ferrata. It only opened in late November, but I was lucky enough to try it out just one week after its opening. It was a relatively early start on the big day, but with a morning of via ferrata ahead of me I was more than happy to oblige. We were to be taking on the Ledge Walk, the entry route that the operators insist most people go on first. Upon reaching the start, I realised I had inadvertently ended up at the front of the group and had therefore volunteered myself as the first in line meaning I would have no guinea pig in front of me! Undeterred, I cracked on and followed our lead guide Andy. The going wasn’t too taxing as we got to grips with the processes involved in climbing a via ferrata; clipping the two karabiners onto a steel cable that was incrementally bolted into the rock face and subsequently unclipping and re-attaching them both one at a time so we were always attached to the line. What followed was essentially a scramble along narrow tracks on the rock face. There were no scary drop offs at this point, but you still had to watch your step as you navigated over the uneven terrain. Eventually, we reached the first zip line. It was only 50m long, but there was an incredibly steep drop that fell away below, so it’s fair to say it was slightly daunting. I crept towards the edge as instructed by Andy and he quickly got me set up on the zip line, before giving me the go ahead. An exhilarating 20 seconds later I had made it to the other side and shimmied along the line to the other guide. Once unclipped, I perched on a level section of cliff and waited as everyone else made their way across. A small stretch of scrambling then led us to the second zip line. Compared to that first traverse, the section between the first two zip lines definitely upped the ante and parts of it were extremely narrow, with the crumbling, sedimentary rock falling away below. The second zip line was 10m longer than the previous and by this point we all knew what was coming. We waited as Andy set us up on the line before taking a leap of faith one at a time and flying through the air. The journey didn’t last too long, but it was incredibly addictive and I couldn’t wait to get onto the 300m line that lay ahead. Luckily, we didn’t have to, as there was only a short traverse standing in our way. Once again the going got tougher and become more challenging and exposed as we went. As we got nearer to the final zip line the terrain got steeper and we faced a couple of small vertical ascents via metal rungs, but eventually we made it to the final part of our via ferrata. The third and final zip line blew the other two out of the water. At 300m, it was the longest by far and it was the quickest too. Whereas the others were short and sweet, this one seemed to go on for quite some time. Parts of it were actually quite unnerving; namely the fact that you were suspended roughly 120m above the ground below, which had a solid, perfectly paved road weaving under your feet. Ultimately though, it was just brilliant. In the end, the Ledge Walk route only took us two hours and so I was lucky enough to be presented with the opportunity to have a go on the more technical route. To say I jumped at the chance would be an understatement, and before long I was stacked out in gear ready to go again. After a short walk we reached the start of our climb. It stretched out above us for 60m, and while it’s a figure that doesn’t look particularly daunting on paper, it could have been the north face of the Eiger as far as I was concerned. Thankfully, I had one extra aspect of motivation on my side. I was to be the first client taking on this particular route. Spurred on by that fact, and by the building excitement inside of me, we got started right away. My guide led the way, and as instructed, I waited for him to clear a couple of sections before following. It’s surprising how much height you gain in such a short amount of time, and after 10 minutes of climbing up metal rungs, unclipping and clipping into each vertical section I was in the groove. 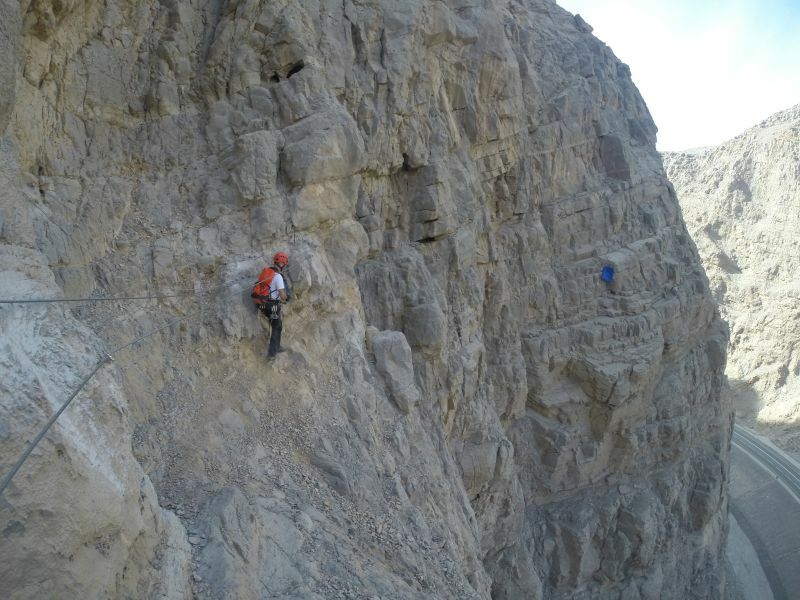 Occasionally, the vertical sections were broken up by a horizontal traverse along the cliff, and as physical as it was, the real challenge came in the form of a couple of overhanging sections. These were the bits that I had been warned about; the sections that were likely to cause me the most trouble. As I approached the first one I was still feeling relatively strong, but it’s surprising how quickly your arms start to ache once gravity is working against you. On the straightforward vertical sections, the task of unclipping and reattaching the karabiners onto the next stretch of cable was simple enough, but on the overhangs it became much tougher. I often found myself clinging on with one hand while dealing with the karabiners, and the effects of this physical work began to take its toll. That being said, as I hung there with my forearms burning, I couldn’t help but feel like an accomplished climber, and it was a great feeling. I guess that’s what is so rewarding about via ferratas. They are accessible. 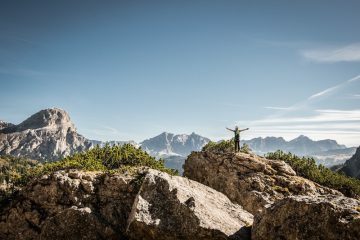 They give everyday hikers the chance to ascend all sorts of gnarly terrain that would otherwise be out of reach. There I was hanging on with one arm, snapping shots with my GoPro, while cars passed by on the black slither of tarmac below. I almost felt like Sylvester Stallone’s Gabriel Walker in the Hollywood blockbuster Cliffhanger. 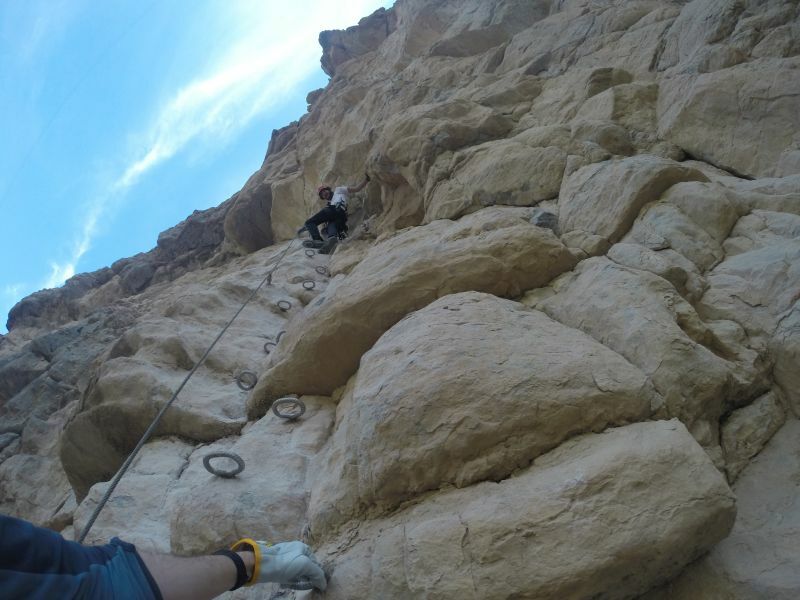 It was always extremely comforting to get past the overhangs and take some weight off of the forearms while standing on one of the metal pegs, though, these moments were short-lived with the rest of the ascent waiting for us. Up until this point, pretty much the entire climb had been exposed, with no ledges or solid ground to stand upon. Essentially, you were clinging onto the edge of the cliff, but once you had got used to the feeling it actually felt pretty special to lean back and take it all in. Once we had edged further along the cliff we were faced with the second major overhang section. The bonus of this one was that once you reached the top, there was a scramble on solid ground which took you back to the main route that we had completed earlier. By this point, I had also (very cautiously) passed my GoPro across to my guide so my satisfaction soared with thoughts of the many action shots he would be snapping of me. Clawing myself up this final overhang was tough, but at the same time there was a massive grin across my face. 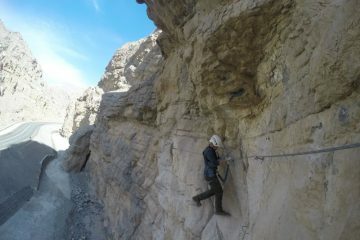 I was about to become the first client to make it to the top of the Middle Path route and it was incredibly rewarding. With a few gruelling karabiner transfers I made it over the lip of the overhang and faced an awkward scramble to get back to the main route. If anything, this section actually felt slightly more difficult as I looked for footholds and handholds, but it wouldn’t be too much trouble for anyone with experience in scrambling. The further we went, the easier it got and in no time at all we were back on the main route of the Ledge Walk. 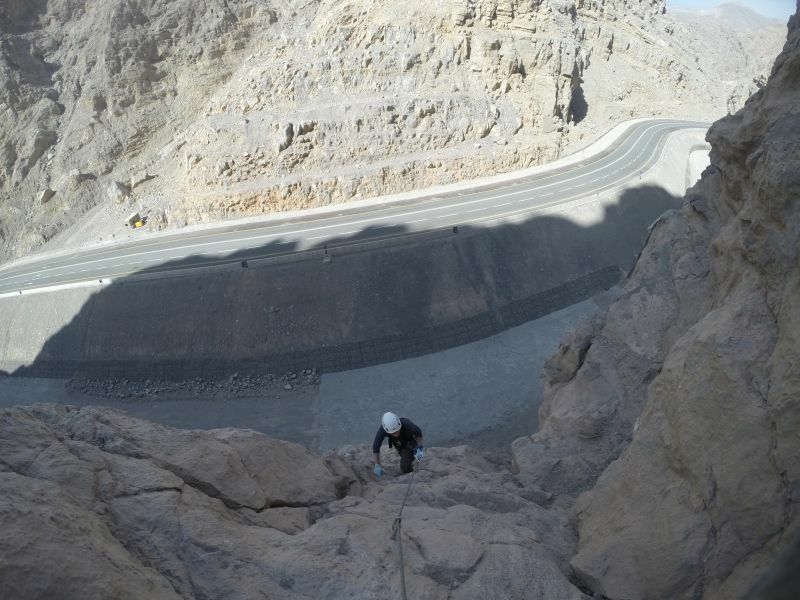 Typically, first timers would then continue on with the standard route, complete with the three zip lines, but as I had already done this we traversed the cliff in the opposite direction and heading back for base with an addictive buzz of adrenaline still running through my veins. 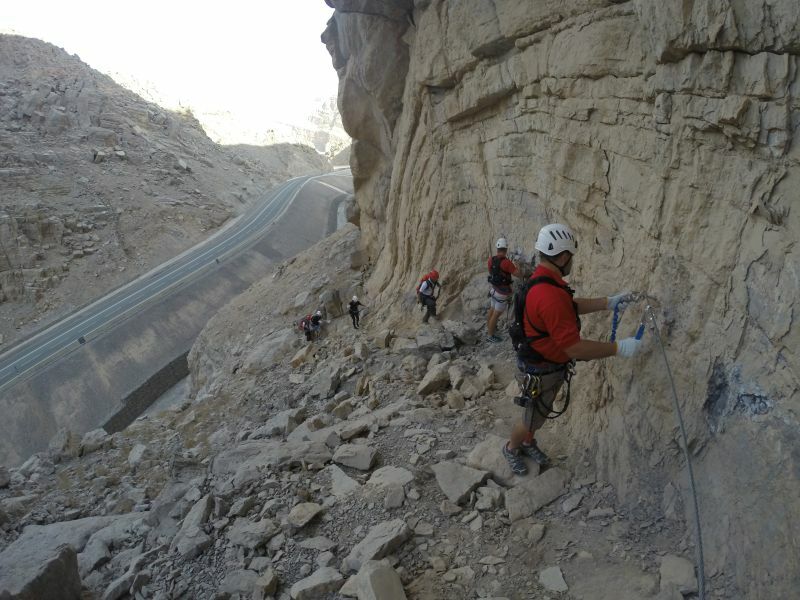 My via ferrata experience in Ras Al Khaimah was the perfect introduction to a new type of adventure, and it was one that has left an itch that will surely only be scratched by exploring more of what the world of via ferrata has to offer. 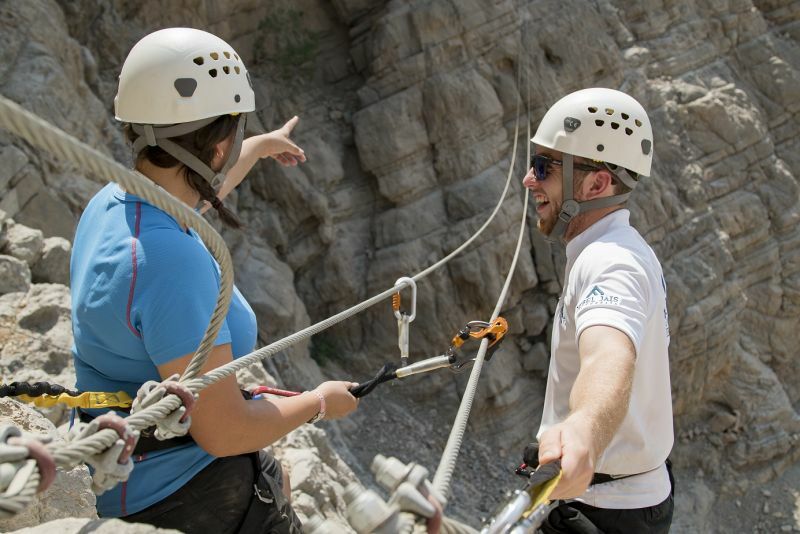 The via ferrata is owned by Ras Al Khaimah Tourism Development Authority and operated by Absolute Adventure, so you’ll need to book in advance to take part. To do so head to www.jebeljais.ae/book-now. Free transfers are available to/from the city or you can make your own way to the site.